Home Earth Changes Why Hurricane Irma drained shorelines in Florida and the Bahamas? Since about a month now, ocean water is disappearing from beaches along the Atlantic coast of Uruguay, Brazil, and more recently in the Bahamas and Florida. So why is the water so dramatically receding? What are the forces behind this once in a lifetime and anomalous tidal event? Why huge storms and especially Hurricane Irma drained shorelines? Hurricane Irma was the most powerful storm to hit the Atlantic. And what makes it a totally unprecedented storm is that it changed the shape of the ocean. Before making landfall in Florida on Sunday, the most powerful Atlantic hurricane on record sucked water inward away from shorelines, leaving bays along the Gulf Coast practically dry. 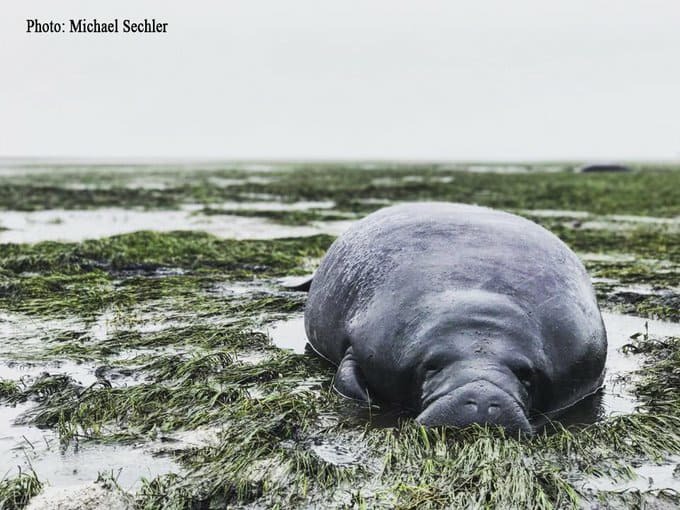 That depleted canals, grounded boats, and, in Florida’s Sarasota Bay, stranded manatees in knee-high mud. Manatee stranded in Florida after ocean water receded dramatically after Hurricane Irma. In Tampa Bay, it receded so much, dogs were able to run on places that would normally be under feet-deep water. But meteorologists warned the water would return after Irma’s eye passed through. The wind direction will shift to onshore, causing water levels along the southwest coast of Florida to rapidly rise in a matter of minutes. Life-threatening storm surge inundation of 10 to 15 feet above ground level indeed occurred in this area. What caused this strange tidal phenomenon? A combination of Irma’s strength and positioning caused the water to recede so much. Storm surge is where strong winds are pushing the water towards the shore. But you can imagine that same force is pushing water away from the shoreline. If the wind is blowing offshore, it blows water away from land. The reason Irma left shorelines so bare was because as its robust low-pressure center approached places like the Bahamas on Friday and Saturday, and Tampa and the rest of the Gulf Coast on Sunday, its record-smashing strong winds were blowing from northeast to southwest — which happens to be the same position as the bay. What is unique in this case is the shore is on a parallel track, so you have the track along the west coast of Florida. The same effect wasn’t seen in Harvey, which devastated parts of Texas earlier this month, because that storm went in on a perpendicular track, he said. How rare is this anomalous water receding? This has happened before, most notably on Long Island, New York, during Superstorm Sandy. But it doesn’t usually affect such a large area. This phenomenon is not unique, except it will be felt much more strongly, much more obviously, when you have a storm this size. Moreover, the timing of the tide made the phenomenon even more extreme. Before the eye made landfall, the winds were blowing so hard offshore at the exact same time of low tide. People saw low water levels that they’ve never seen before on the west coast of Florida. While it looks similar to what happens when an earthquake causes water to recede before a tsunami, it’s not the same thing. A tsunami is not caused by wind. That is purely dynamics. The hurricane-related water retreat is mostly caused by the winds. Yes. It already has in many of Florida’s shorelines. And all over South America. Once the storm has moved, the water moves back in where Irma has already passed. The westerly flow brings it back almost immediately with some flash floodings in some areas. So when water recedes, get under cover, fly away, a flash flood or tsunami could swept you out of this world.